Polka Dot Overload | Sewing, knitting & vintage projects, tips, tutorials and cartoons! : Meet the Brooklyn BSC! ...And I don't mean the Babysitter's Club (though I totally had 40 of those books when I was 9). It was a warm spring Sunday in Brooklyn yesterday and I took a long and lovely (if rather breathless--Cartoonist Baby is really squishing my lungs these days) stroll down to Carroll Gardens for my second monthly meeting of the Brooklyn BurdaStyle Sewing Club. This club is just way too fun and fabulous! They (we, actually!) get together once a month, usually at an apartment in Brooklyn, share tasty snacks, and obsessively talk fabric, patterns, magazines, machines--you know the drill. There's a little show and tell where we go around in a circle, display our latest projects, talk about what we're working on next and share/solicit advice. Everyone has her (so far just women at the two meetups I attended) own distinct taste, but there seems to be a general love (unsurprisingly) for BurdaStyle web and magazine patterns. And we bring fabric and envelope patterns to swap--I restrained myself this time and just destashed without making any new acquisitions, though last time I picked up a beautiful B&W silk charmeuse print for the great price of FREE. 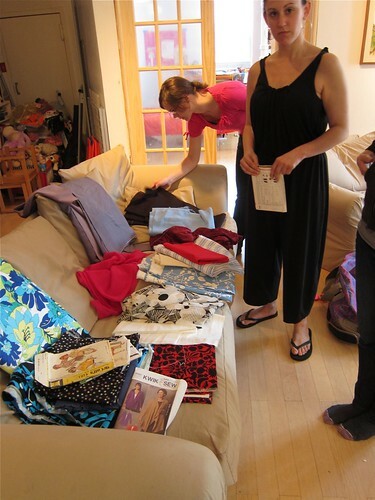 Kathrin and Dina checking out the fabric/pattern swap pile... Dina is wearing the Burda 3/2010 magazine jumpsuit made from fabric from Spandex House. The group officially has 25 members and counting, though at the two meetups I attended there were just 7 or 8 of us. 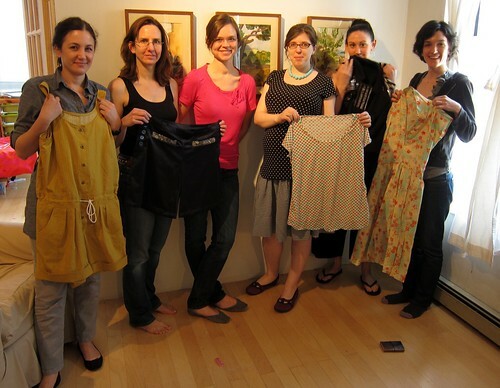 From L to R: club founders Ana and Valerie, Kathrin, me (Mikhaela) in my polka dot maternity modified Jalie 2005 T and self-drafted gingham maternity skirt; Dina in her Burda magazine jumpsuit (March 2010, I think), Cheryl. Anyway, if you live in Brooklyn (or don't mind the subway ride) and love to sew, please drop Valerie a line, we'd love to have you! Bummer, it looks like I missed a lovely meeting. I hope I get to meet you next time! 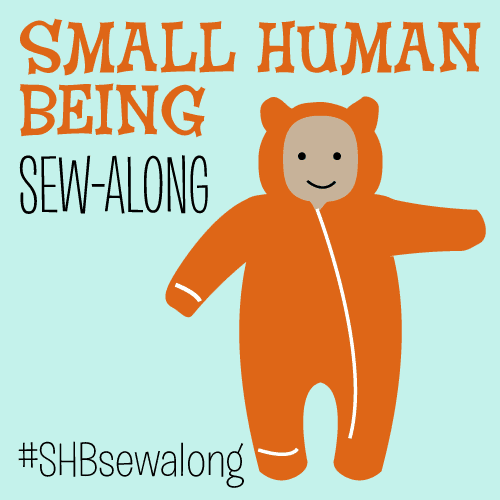 I didn't realize there was a NYC based sewing group meetup. I just joined, so hopefully I can attend one of these days.